I went to The Naked Sheep, a new LYS in my neighborhood, to look for possible yarn options for the Cutaway. Unfortunately, the yarns that I would have liked to use were at least $7 a skein. That's a little steep for my budget. So, of course, I turned to Elann and Knitpicks. There were a lot of appropriate yarns on Elann, but most of them had only one color choice left. They also have a lot of new stuff coming out in mid-October, but I can't wait that long. 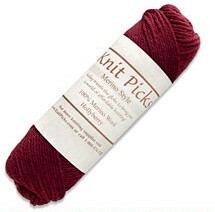 Instead, I opted for the Merino Style from Knitpicks. I got 10 skeins in coal for a whopping total of $22.90! That's only $2.29 a skein!